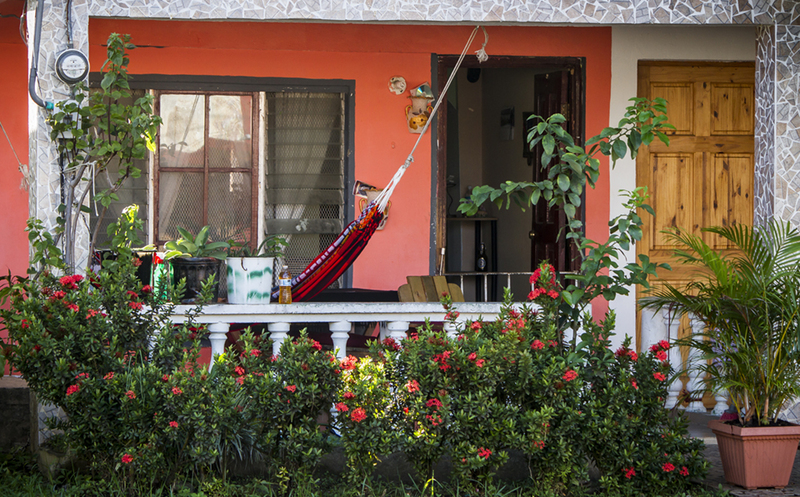 Beautiful houses in Bocas del Toro. Yes, this is one of the “I quit my job to travel” stories, but it’s not as glamorous or appealing as it might sound. I have been wanting to get away from my desk job for many years, but building a tiny house tied us down to our bi-weekly paychecks. My only motivation to drag on was the fact that our home was hopefully going to afford us the nomadic lifestyle we have been longing to live for so long. When the end of our house construction was finally within sight, I made plans to travel alone for a little while, just to get away from everything. And with everything I’m not only talking about my cubicle, but also the depression that came with it. I’m a vagabond at heart, so even working for a great company with nice co-workers did not help to make me more comfortable sitting in front of a computer 40 hours week. If you add to the mix that our tiny house was sucking up everything we earned, forcing us to move back in with parents, being depressed hopefully becomes a little more justified. Don’t get me wrong. I’m trying to count my blessings every single day, and I know how lucky I am for being able to do all this while also having the support of our families, but the circumstances still weren’t easy for me. My decision to go to Panama was influenced by two major factors: 1. We have a classic children’s book in Germany called “Oh, wie schoen ist Panama” (translated: Oh, how beautiful is Panama) which basically put this country on the top of my travel list before I was even old enough to have one. 2. Since I came to the USA in 2010, flights to my home country helped me to collect thousands of miles with a specific airline and by now I had acquired just enough to book my round trip to Panama for only $80. Speaking about traveling on a budget: This whole trip cost me about $800 and I traveled for two weeks even though I had originally planned four. The expenses would have been roughly the same had I stayed for two more weeks. Why so and the reason I returned early are explained below. First of all, I wasn’t going to be on the move during the entire duration of my trip. My original plan was to work for three weeks, and then explore the country for another seven days. The ecological farm I stayed at was beautiful. 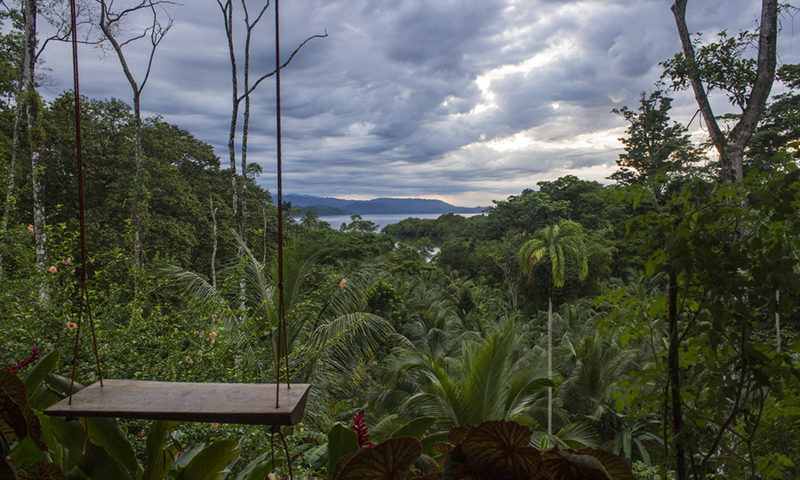 Located on an isolated island in Bocas del Toro, it was completely surrounded by tropical rain forest. Coconuts and pineapples were growing everywhere. I fell asleep to the chirping of the cicadas, awoke to the roaring of monkeys and showered myself with rain water. One day, two fellow volunteers and I followed the trail into the dense forest to look for wild bananas. Swinging a machete in my hands while scouting the tree branches for exotic animals was a very memorable experience. View over the bay from the front porch of the farm. But this idyllic scenery came with its drawbacks. Like the sweat which seemed to leak out of every pore of my body. If it wasn’t raining, there was hardly any breeze and I felt like walking in a hot steam bath all day long. Of course, I had anticipated this scenario, especially since I was visiting in July, and had taken precautions: wearing a bandana to keep the hair out of my face, drinking a lot of water and taking enough breaks to keep my body from overheating. What I did not expect, though, was how lethargic I would become. I’m usually a doer and can easily stay active all day long. If there’s something that needs to get done, I don’t wait and I take care of it. Well, in Panama I experienced a different side of me. Suddenly all I wanted was to sit, be lazy and do nothing. And that was very strange… The humidity was indeed pushing me to my limit. And since volunteers were sleeping in an open guest house with no electricity, I got no relief from it. Nor from the mosquitoes, which seemed to love me. After a few days, I spent all night spreading cortisone all over my arms and legs while trying hard not to scratch. Damn, that required some serious strength of will! 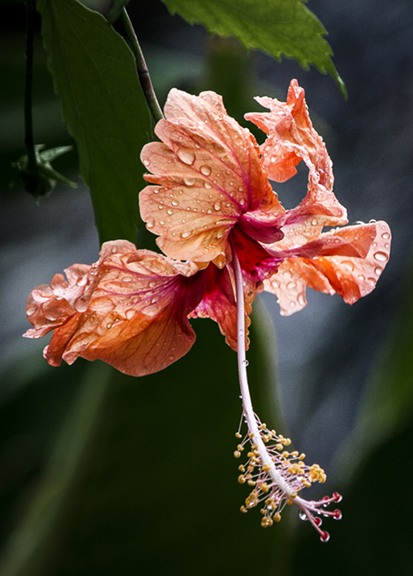 One of the many flowers blooming all over the farm. However, the worst thing, which eventually made me quit, was the owner of the farm, a woman from Austria. She barely explained anything but expected me to know everything right from the start. Overall, she was very self-centered, uncaring and actually rude. Whenever I wanted to know something, she gave annoyed answers, but seemed to get some kind of pleasure out of complaining all day long about how other helpers and native Panamanians criticized her for things she does: spraying poison to kill termites, draining the swamps for agricultural use or installing wood as roofing. Um… Apparently it never occurred to her that locals might know best. After all, it’s their country. Also, shouldn’t volunteers give you the chance to look at your situation from a fresh and different pair of eyes? That’s at least how I would approach it, if I had foreign people come to help at my farm. But she was that kind of person which, no matter what you say, always knows better. Needless to say, that was not the kind of exchange I had hoped for. Still, I learned some great lessons and I feel neither shame nor regret about going there or leaving early. 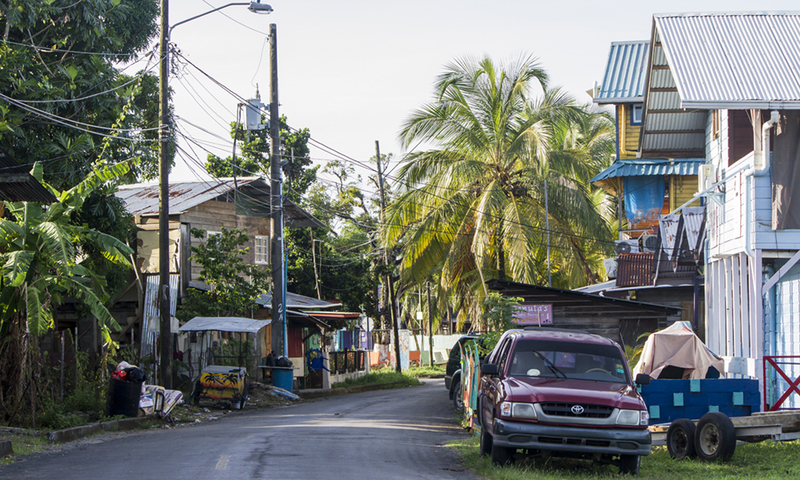 Street in Bocas Town. My hotel was the blue and yellow building on the right. I made one of my dreams come true and visited a chocolate farm (Oreba). First, I had to walk all over town trying to find one of the few places that sold tickets. It only cost $30 but since I needed to return to the mainland, I had to add another $10 for the water taxi round trip. It turned out that I was the only visitor and that made me really nervous. Why? 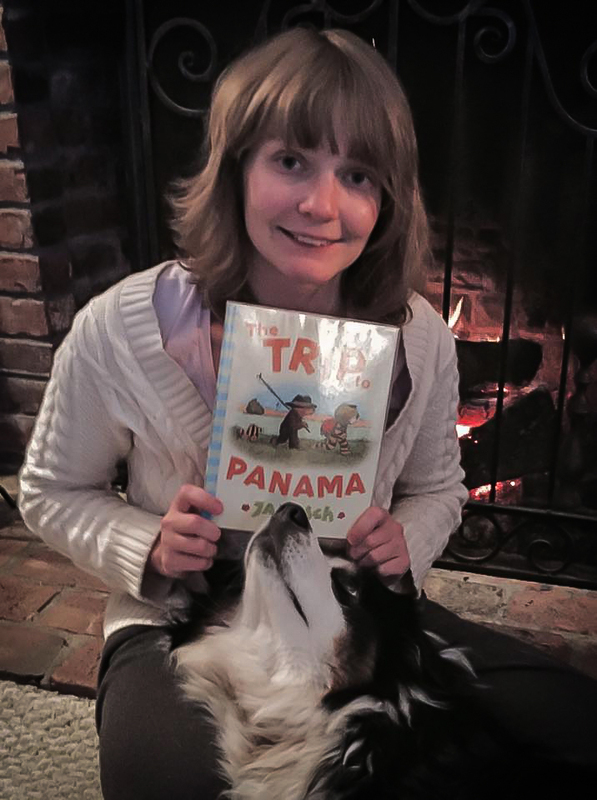 There was no shuttle to pick me up and everyone at the terminal told me to wait, saying someone would come, at some point… Luckily, I had already learned that things work differently in Panama. Nobody really knows what’s going on and a set time is only an estimate, not something you can rely on. Eventually a taxi came and brought me to the native village. The second I stepped back out, I was swept away in beauty – the land, the people, the energy. 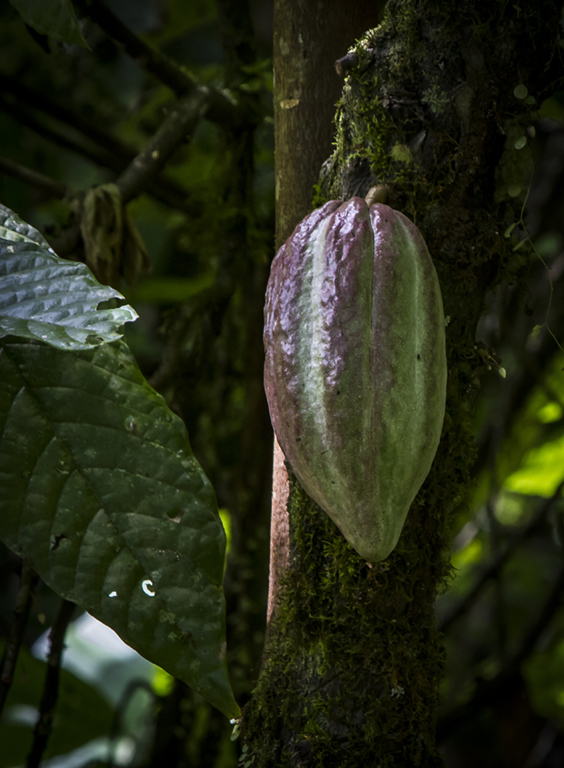 I loved every second of my private tour during which I learned everything about the chocolate-making process, from growing your seeds to grinding the beans to powder, while also getting to know the way of life of the indigenous people. I don’t want to give away the whole experience but I can highly recommend it, especially since all the proceeds go right into the village and not into other people’s pockets. 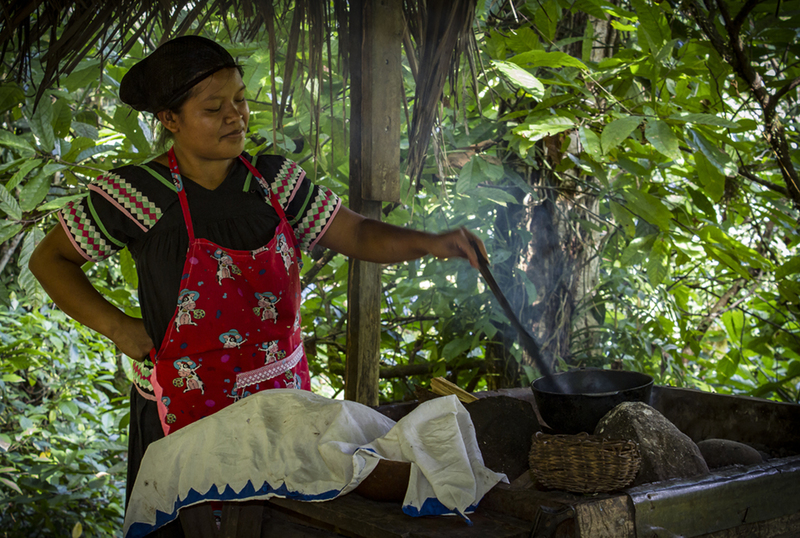 A native woman shows me how the indigenous people roast cacao beans. The famous male Quetzal with its long, colorful tail. You’ve probably guessed it by now: I’m not a city person either. I experienced the capital as loud, crowded, hot and dirty, but that doesn’t mean it’s not worth a visit. It’s just my humble opinion. Since I only stayed two days, one at the beginning and one at the end, I did not get to do much. Maybe staying longer would have changed my mind. The short amount of time I had forced me to be a tourist. $29 bought me a ticket for the hop-on, hop-off bus which helped me to see the Panama Canal and Casco Viejo, the old and historic district of the city. I couldn’t leave Panama without having seen those sights, right? The skyline of Panama City with Casco Viejo in the foreground. You might think it’s a warm country, but if you’re hopping on buses to go to other places, pack warm clothes! They run the AC like crazy. Negotiate your price before you get on a taxi in Panama City – and make sure you learn the Spanish numbers, most drivers don’t speak English. If you’re staying in a nice hotel, don’t catch a taxi from there, walk a little down the street. Go to the Panama Canal in the early morning or early afternoon. Your chances of seeing ships passing through will be much higher! Don’t skip a visit because of the raining season. It barely rains all day, and some days it does not even rain at all, but if it does, expect a heavy downpour. Don’t be afraid to go alone. Panamanians are very friendly and helpful if you ask kindly.